I just couldn’t wait any longer. I say it’s officially time for a Fall inspired post. I love all the flavors of Fall. 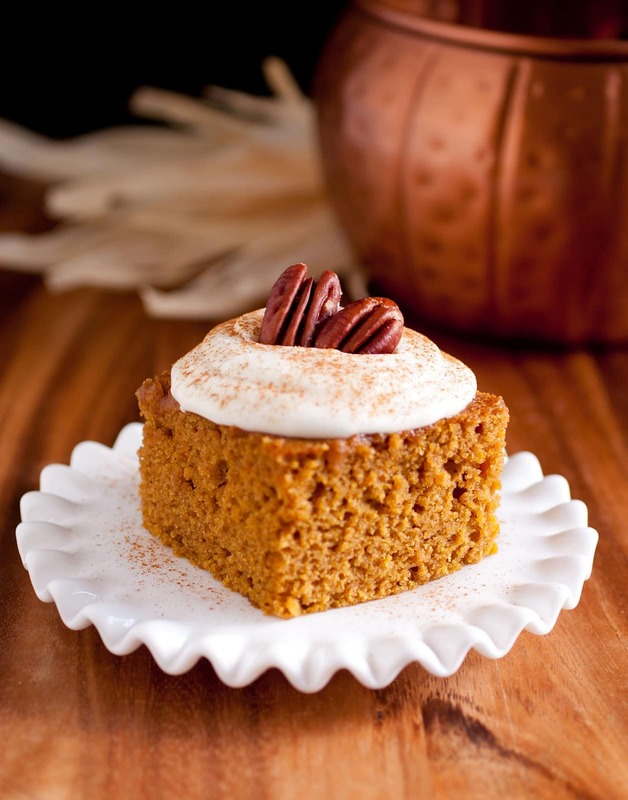 The aromatic spices, the caramel apples, the pumpkin pie and the fresh off the cob corn. One of my favorite Fall flavors is pumpkin. It’s natural sweetness and moisture along with it’s power packed nutrition makes it a perfect choice for countless dishes and desserts. I created this recipe to be a thicker bar than my banana bars because I received several comments of people saying they’d like a thicker bar. 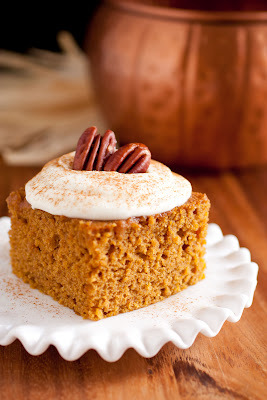 These are basically the same thickness of cake, so you can call it pumpkin cake if you’d like. 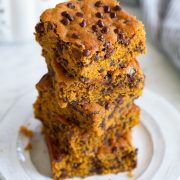 I chose to make this a bit lower fat than your average pumpkin bar by using half butter and half applesauce (rather than all butter or oil). You would never know it is halfway healthy =). I love when I can turn a Superfood into a dessert (if you top them with walnuts you can get two Superfoods between the pumpkin and walnuts). Try these bars and they are likely to become one of your new favorite fall desserts! 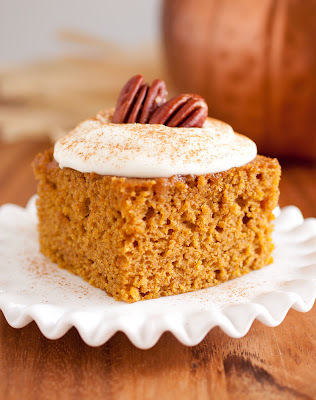 Thick fluffy pumpkin bars swirled with spices and finished with a luscious cream cheese frosting. Preheat oven to 350 degrees. In a mixing bowl, whisk together flour, baking powder, baking soda, salt, cinnamon, nutmeg and ginger, set aside. 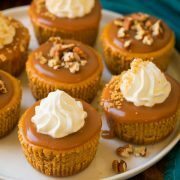 In a separate large mixing bowl, using an electric hand mixer, blend together light-brown sugar, granulated sugar, melted butter and applesauce until well combine. 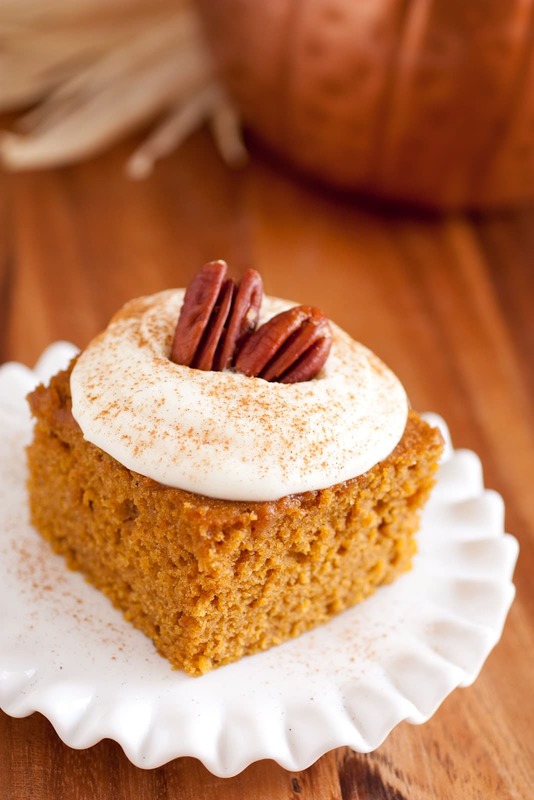 Add eggs and vanilla extract and mix until well blended, then add pumpkin and mix until well blended. Add dry mixture and mix just until combine. Pour and spread mixture evenly into a buttered 13 x 9 inch baking dish and bake in preheated oven about 35 - 38 minutes until toothpick inserted into center of cake comes out with a few moist crumbs attached. 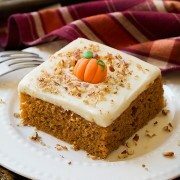 Allow bars to cool completely (I covered the baking dish after 15 minutes of cooling to seal in moisture) then cut into bars and frost with Fluffy Cream Cheese Frosting (alternately you can frost bars first then cut into squares) and dust lightly with optional cinnamon and garnish with optional pecans. In a large mixing bowl, using and electric hand mixer, whip together butter and cream cheese on medium speed until very light and fluffy, about 3 -4 minutes. Mix in vanilla. Add powdered sugar and mix until well blended and smooth.